Tamara Munzner. Visualization Analysis and Design. 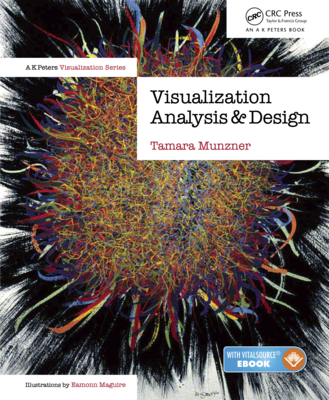 A K Peters Visualization Series, CRC Press, 2014. Ch 1. What's Vis, and Why Do It? CRC press order page with book/ebook bundled together for same price as book alone (list price of US$80). Amazon US (hardcover/ebook): (in Jan 2019 listed at US$72, off list price of $80). Note you get VitalSource ebook too, scratch-off code inside front cover. Amazon Canada for hardcover/ebook bundle (Jan 2019 CAD$104) or Kindle (Jan 2019 CAD$86). All Lecture Slides: 393 total. Covers all chapters of book plus some extras (Design Study Methodology, Next Steps, In-Class Exercise). Source files are Keynote, also exported as PowerPoint and PDF. These slides are much more complete than what I use in my own grad course where I just have a skeleton that I go through quickly, since the students are required to read book chapters before lecture. Figures: all diagrams in PDF format for download. Free to use with attribution (CC-BY-4.0 license). Further Reading: references as discussed at end of each book chapter, chapter by chapter, including hyperlinks to papers. Errata: all errors noted so far in first edition. Please contact me if you find an unlisted one! Instructors can use this book in different ways: some work their way through Chapters 1 through 15 in order they appear in the book, some use many of the chapters but in a customized order, and some use just a few selected chapters as part of a mix with other materials. You'll see examples of all of these approaches in the links below. Let me know if you use the book in your course and I'll add it to the list!